The Northeast is generally considered to be a moist region with ample rain and snow, but droughts are not uncommon. Widespread drought has occurred across the region as recently as 2016, and before that in the early 2000s, 1980s, and mid-1960s. More frequent and severe droughts are expected as climate change continues to increase temperatures, raise evaporation rates, and dry out soils - even in spite of more precipitation and heavier rainfall events. Annual projections indicate an overall increase in precipitation (top graph), with continued summer dry spells (bottom graph). Note: Observational records go through 2005 and the model begins projecting in 2006. The 2016 drought is not reflected in these graphs. This figure is based on a single model and is only one of many possible futures. It does not provide a prediction of timing of future dry periods, only an indication of the expected variability of summer rainfall in relation to past variability. Figure courtesy of Ambarish Karmalkar, NE CSC. When Massachusetts is already in a relatively dry period, warmer temperatures will have a larger impact on drought. Warmer temperatures will likely mean less snow in the winter, resulting in decreased snowmelt in spring when most plants need it most. Annual precipitation across the Northeast varies, with the highest amounts occurring in the mountains and coastal areas. Increased variability and unpredictability in precipitation will likely cause negative ecological impacts on species and ecosystems, such as changes to biodiversity, species distributions, and productivity, if they are not able to adapt to change. 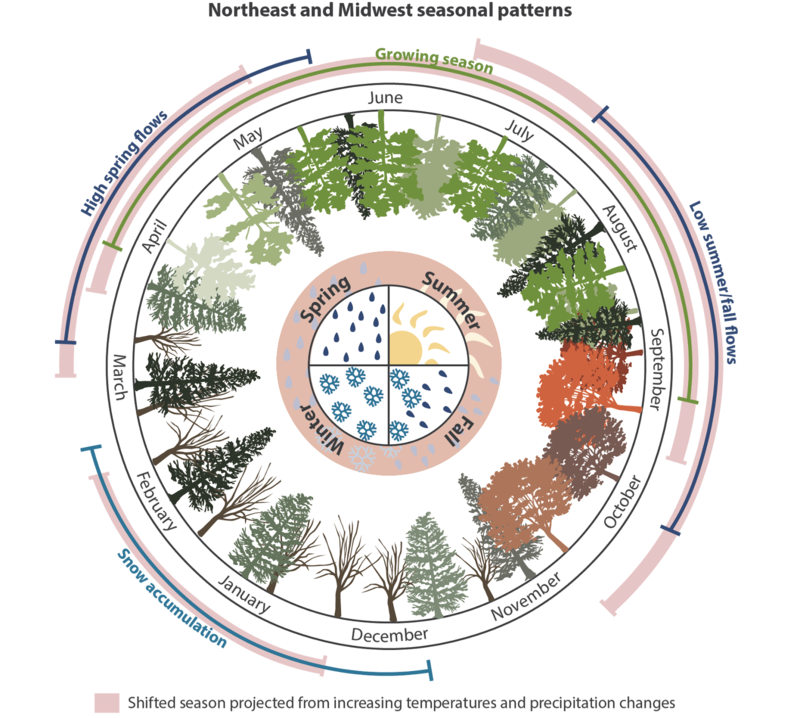 Conceptual diagram illustrating shifts in Northeast and Midwest seasonal patterns due to climate change. Diagram courtesy of the Integration and Application Network, University of Maryland Center for Environmental Science. Historical (black line) and projected seasonal averages of soil water storage (amount of water stored in the soil column) in Massachusetts according to an average of 33 downscaled CMIP5 models. A low (RCP 4.5) scenario of projected changes is shown in blue and a high scenario (RCP 8.5) in red. Solid lines show average model results and their standard deviations are indicated by the respective shaded envelopes. Data and graphs are courtesy of the USGS National Climate Change Viewer. Our existing regional forests grew during a time period when there was relatively ample water available. As a result, many species in Massachusetts are drought-intolerant, such as bats, salamanders, toads, freshwater fishes, and mussels. Consequently, these species and their supporting habitats depend on current seasonal water regimes and are highly vulnerable to changes in where, how, and when water is delivered. The Northeast is home to nearly half of the U.S. population. It contains a large network of supporting infrastructure as well as diverse ecosystems.6 Human water use, such as for water supply, irrigation, and hydropower production, competes with environmental flows for aquatic species and other ecological services during periods of drought. This complicates water management actions and coordination in Massachusetts and is further complicated by diverse private and public land ownership. Changes in how humans respond to drought (e.g., increased irrigation) can increase competition for ecologically available water and pose substantial threats to ecosystems, even if supply (precipitation) increases. Proactive strategies that consider the interaction of drought impacts with other stressors (urbanization, sea level rise, invasive species, etc.) are becoming increasingly important. 1. Catanzaro, P., A. D’Amato, and E.S. Huff. 2016. Increasing Forest Resiliency for an Uncertain Future. U.S. Department of Agriculture, Northeast Climate Science Center, and Northern Institute of Applied Climate Science, 32 p.
2. Clark, J.S., L. Iverson, C.W. Woodall, C.D. Allen, D.M. Bell, D.C. Bragg, A.W. D’Amato, F.W. Davis, M.H. Hersh, I. Ibanez, et al. 2016. The impacts of increasing drought on forest dynamics, structure, and biodiversity in the United States. Global Change Biology, 22, 2329–2352. doi: 10.1111/gcb.13160. 3. Frumhoff, P.C., J.J. McCarthy, J.M. Melillo, S.C. Moser, and D.J. Wuebbles. 2007. Confronting Climate Change in the U.S. Northeast: Science, Impacts, and Solutions. Synthesis report of the Northeast Climate Impacts Assessment (NECIA). Cambridge, MA: Union of Concerned Scientists (UCS). 4. Groisman, P. Y., R. W. Knight, and O. G. Zolina. 2013: Recent trends in regional and global intense precipitation patterns. Climate Vulnerability, R. A. Pielke, Sr., Ed., Academic Press, 25-55. 5. Hayhoe, K., C.P. Wake, T.G. Huntington, L. Luo, M.D. Schwartz, J. Sheffield, E. Wood, B. Anderson, J. Bradbury, A. DeGaetano, T.J. Troy, and D. Wolfe. 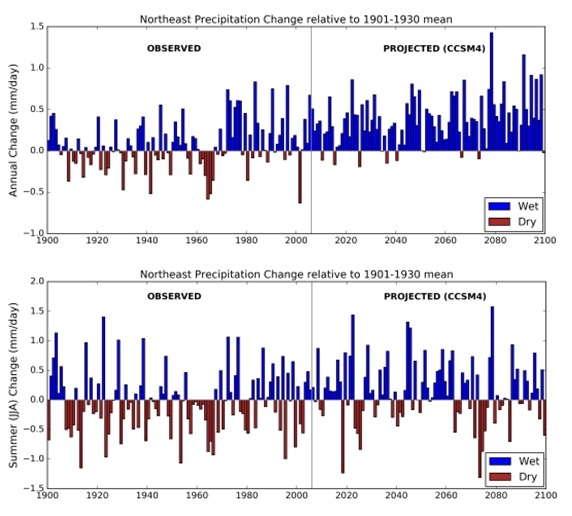 2006: Past and future changes in climate and hydrological indicators in the U.S. Northeast. Climate Dynamics, DOI: 10.1007/s00382-006-0187-8. 6. Horton, R., G. Yohe, W. Easterling, R. Kates, M. Ruth, E. Sussman, A. Whelchel, D. Wolfe, and F. Lipschultz. 2014. Ch. 16: Northeast. Climate Change Impacts in the United States: The Third National Climate Assessment, J. M. Melillo, Terese (T.C.) Richmond, and G. W. Yohe, Eds., U.S. Global Change Research Program, 16-1-nn. 7. Karl, T. R., J. T. Melillo, and T. C. Peterson, Eds., 2009. Global Climate Change Impacts in the United States. Cambridge University Press, 189 pp. Online at http://downloads.globalchange.gov/usimpacts/pdfs/climate-impacts-report.pdf. 8. Massachusetts (MA) Drought Management Plan. 2013. Massachusetts Executive Office of Energy and Environmental Affairs and Massachusetts Emergency Management Agency. 41 p. Online at: http://www.mass.gov/eea/docs/eea/wrc/droughtplan.pdf. 9. National Oceanic and Atmospheric Administration (NOAA). 2016. Drought Impacts and Outlook: Northeast Region, July 2016. Northeast Regional Climate Center. Online at: www.drought.gov/drought/resources/reports. 10. Thibeault, J.M. and A. Seth. 2014. Changing climate extremes in the Northeast United States: observations and projections from CMIP5. Climatic Change, 127: 273. doi:10.1007/s10584-014-1257-2. 11. U.S. Environmental Protection Agency (EPA): Climate Impacts in the Northeast. Online at: https://www.epa.gov/climate-impacts/climate-impacts-northeast#main-content. 12. Walsh, J., D. Wuebbles, K. Hayhoe, J. Kossin, K. Kunkel, G. Stephens, P. Thorne, R. Vose, M. Wehner, J. Willis, D. Anderson, S. Doney, R. Feely, P. Hennon, V. Kharin, T. Knutson, F. Landerer, T. Lenton, J. Kennedy, and R. Somerville. 2014. Ch. 2: Our Changing Climate. Climate Change Impacts in the United States: The Third National Climate Assessment, J. M. Melillo, Terese (T.C.) Richmond, and G. W. Yohe, Eds., U.S. Global Change Research Program, 19-67. doi:10.7930/J0KW5CXT.